Just three weeks after conception, a typical human child will begin to form a spine. If one, however, is a Chief Justice on the U.S. Supreme Court, it may take a lot longer. 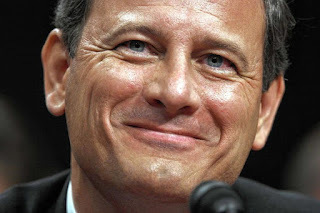 Actually, I used to think Chief Justice John Roberts was lacking a spine. It turns out, he was missing a heart. Tonight the U.S. Supreme Court temporarily blocked enforcement of a Louisiana law requiring abortionists to have admitting privileges at a hospital within 30 miles of where they perform abortions. The Fifth Circuit Court of Appeals had previously ruled in favor of the Louisiana law, which was introduced in 2014 by Democratic State Representative Katrina Jackson and passed by overwhelming bipartisan majorities (88-5 in the House and 34-3 in the Senate). The case is June Medical Services L.L.C. v. Gee. So here's the deal, Roberts sided with the state law in the previous case when it didn't matter because they didn't have enough justices. But when it came time to stand up and his vote would actually count, he betrayed pro-lifers. The good news, however, is that Roberts will be invited to all the best parties. The babies presumably will not. and pro life people have known that all along. abortions now in New York. The abortion industry has been very successful at covering up deaths occurring during those "safe and legal" abortions, and at keeping attention off the Gosnells. Another Cardinal Dolan Catholic who wants to be accepted by the cool kids. Apparently a seat at the Al Smith Dinner is worth a few million dead children. It takes my breathe away to learn that here in America human life is as worthless as lives in 3rd world countries. An animal or caterpillar gets more protection from these heartless democrat women than an innocent little baby who is tortued and cut to pieces in the womb of it's mother. Why dont people of this country stary waking up and tske it back from the hands of our so called "representitives". We used to. We used to fight. The battle of Athens in 1946. Corruption, bad politicians and law makers. The town took up arms and stopped it. I do not get why this is not happening all over the country.